The old theme didn’t handle searches properly. It only returned first page of results without a link for older entries. I couldn’t figure out where the script was buried in the theme so I thought I’d just use a theme that handled the search correctly. The colors are a bit in your face purple right now. Sorry about that. I was hoping for something a bit more soothing. Oh well. At least search works now. When I just have a couple of rows to count, I’ll pull out paper and pencil and start my tick marks. While growing up, I was taught to use the Chinese character 正 (right in the photo above). The character is made of 5 horizontal and vertical strokes. The character means “straight, upright”. 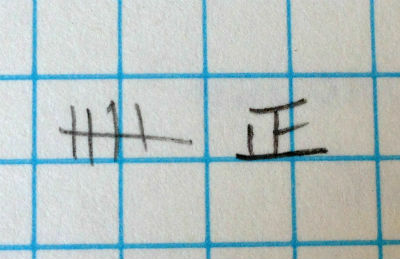 When I moved to the US, I was taught to use the Westernized tally marks (left in the photo above), comprising of 4 vertical marks followed by a slash across the 4 to mark the completion of 5. This has become my default method for marking. The problem with the Westernized tallies is that it is sometimes hard to distinguish 2 (||) from 11, if you are picking up after a long rest or from someone else’s notes. So, how do you tally? I received the new Webs catalog in the mail. 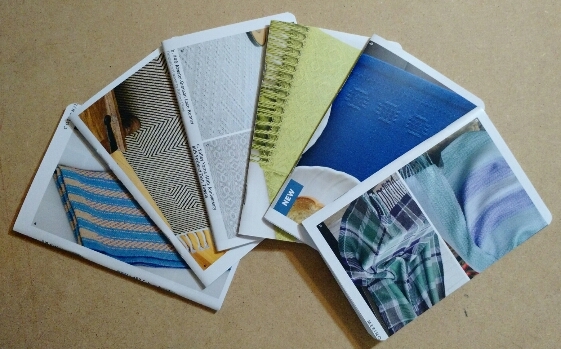 Just as I was going to drop it off in the recycle bin, I looked at all the pretty projects in the catalog and decided that they would make pretty nifty covers for some of my DIY Moleskine Cahiers/Field Notes knockoffs. They are pretty much smaller versions of my project notebooks. Now, I have some pretty eye-candy notebooks to capture more fiber ideas on the go!